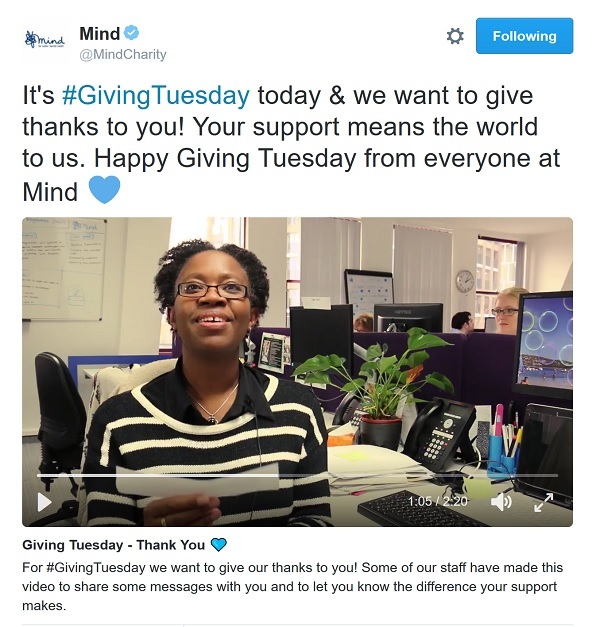 Now in its fourth year in the UK, #GivingTuesday is a chance for charities large and small to ask, thank and share news of the difference they make. It is the antidote to #BlackFriday and #CyberMonday (all of which seem to last much longer than a single day). Here are some great Twitter examples from this year’s day. 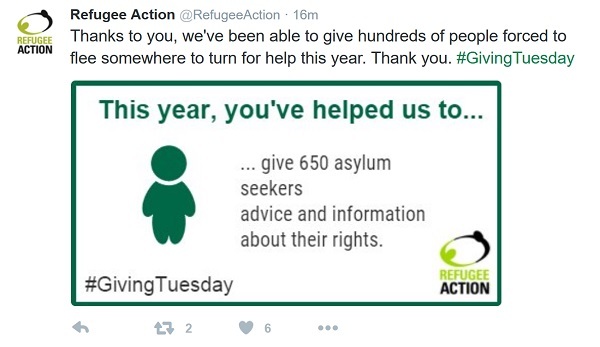 #GivingTuesday is a hugely busy hashtag (trending across the world on the day) so there is a lot of competition. On all channels, a simple, eye-catching ask stands out. The standard digital fundraising rules apply – cater to short attention spans, make donating time or money easy to do and pleasurable and give a reward. 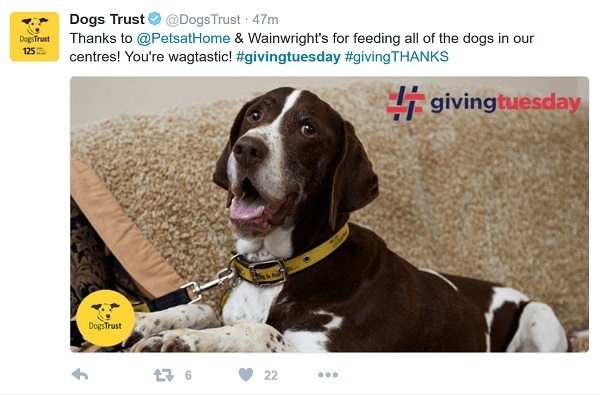 This tweet from Dogs Trust ticks all the boxes. It clearly lists four ways to give support, it uses eye-catching emojis and readable / edited bit.ly links plus a bonus video of a dog rolling in the grass! Similarly, LSE student volunteer centre shared four images on Twitter along with four actions. Breakfast in a Bag simply asked for £3 donations. 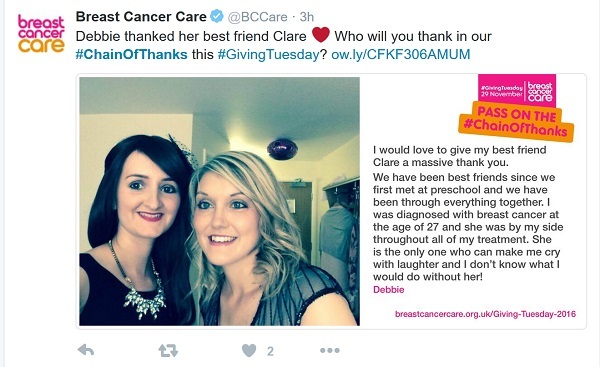 #GivingTuesday is as much a chance to say thank you as it is to ask. It is an opportunity to celebrate all your amazing fundraisers, donors, campaigners and volunteers. Personal thanks or general thanks work well. Help for Heroes produced this lovely video to thank their fundraisers, volunteers, supporters and partners. It means more as it is a face-to-face thanks from the people whose lives have been helped by the charity. 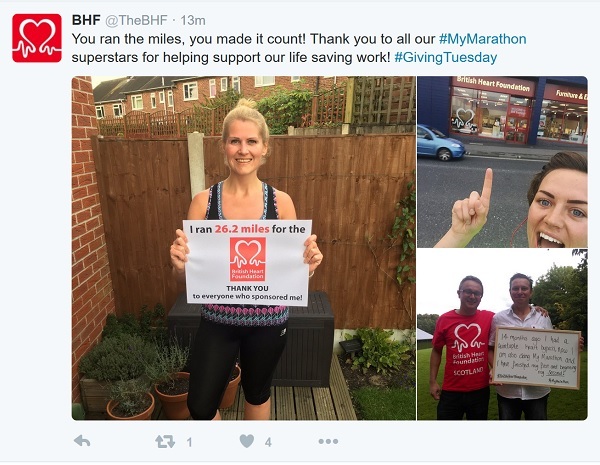 The British Heart Foundation are expert producers of thank you gifs and images. Their feed is full of great thank you images like this one. Marie Curie produced hand-drawn doodles for a selection of their supporters to say thank you. For one day only, Facebook matched donations made via their native giving tool (not those made by clicking a donation button on the platform which links elsewhere). This tweet from Winston’s Wish explains the ask. A link to the Facebook page would have helped to encourage supporters to shift platform. Selected Big Give charities are part of their Christmas Challenge which launched at midday on #GivingTuesday. The 500 organisations lucky enough to be included are benefitting from doubled-donations to their listed projects. In the first five minutes, half a million pounds were raised! Eye-catching campaigns like Cats Vs Kids from The Childhood Trust, aim to inspire new supporters as well as current ones through #GivingTuesday and the #ChristmasChallenge17. CAF were offering to add a bonus £100 to a £10 donation for individuals opening a new account before 30 November. Action on Hearing Loss Scotland devoted the whole day to share stories of amazing fundraisers, achievements, future events and their #earringforhearing campaign. Yorkshire Dales Millennium Trust‘s campaign aimed to raise enough money to plant 100 trees. #GivingTuesday is a great opportunity to break all the rules, produce something special and have fun. Southmead Hospital Charity produced a charming video which explained how a £5 donation would help. The Parkinson’s UK please donate video is all the more charming as it has outtakes. Breast Cancer Now asked supporters to send messages to their researchers. And then showed some of the results. 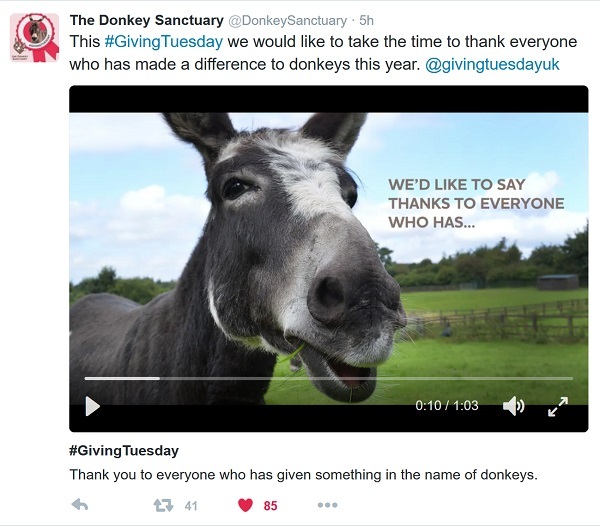 Aardman Animations chose #GivingTuesday to launch their Turkey Dash featuring 8 UK charities. Didn’t get involved this year? 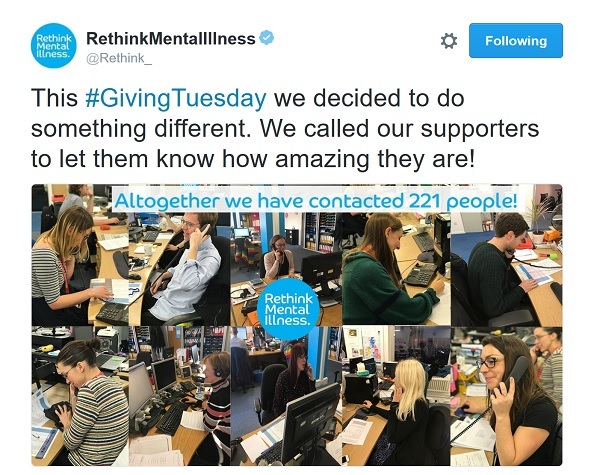 UK Fundraising reported that almost 2000 partner charities and businesses joined in with #GivingTuesday this year. CAF shared stats on the reach of the day, including an impressive 383million impressions on Twitter. And CAF’s press release said that the hashtag was trending on Twitter in the UK from 8.30am to 5.30pm. Blackbaud shared data too including that 26% of online donations were made via mobile. The #GivingTuesday hashtag was used in over 150 countries on the day. If you didn’t get involved this year, make sure it is on your calendar for 2018 – 27 November. And think about how you can make your comms stand out from the crowd. 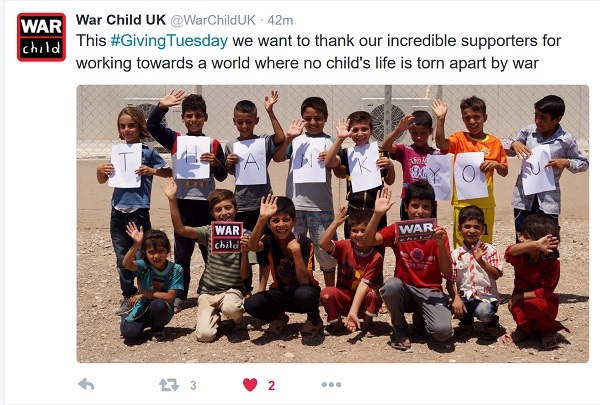 Share your favourite #GivingTuesday examples from Twitter or other channels here. I’d love to see them. I also shared my top three highlights from the day in this JustGiving post. 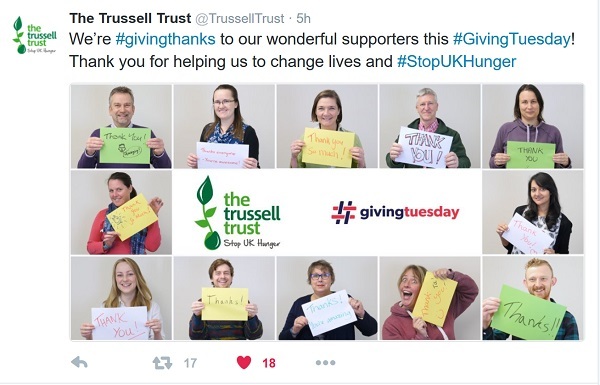 It’s interesting to see how the comms have evolved since #GivingTuesday launched in the UK in 2014. Here’s my storify with examples from the first year.